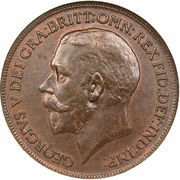 Sir Edgar Bertram Mackennal, KCVO, usually known as Bertram Mackennal, was an Australian sculptor, most famous for designing the coinage and stamps bearing the likeness of King George V. Signature: "BM". 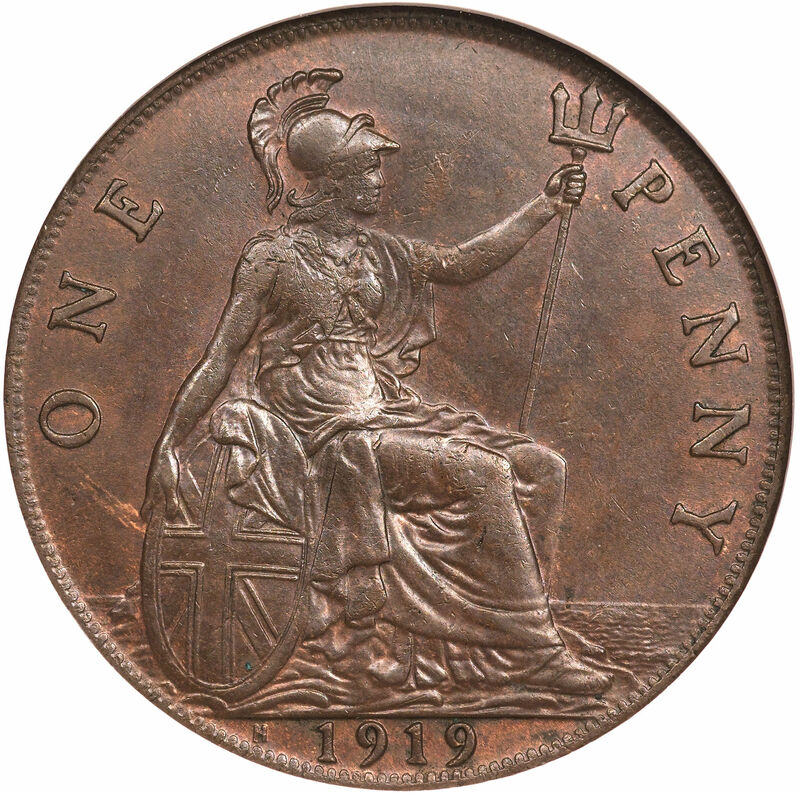 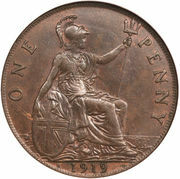 Seated figure of Britannia right, with trident in left hand and shield bearing the Union flag in right, sea behind, denomination above and date in exergue. 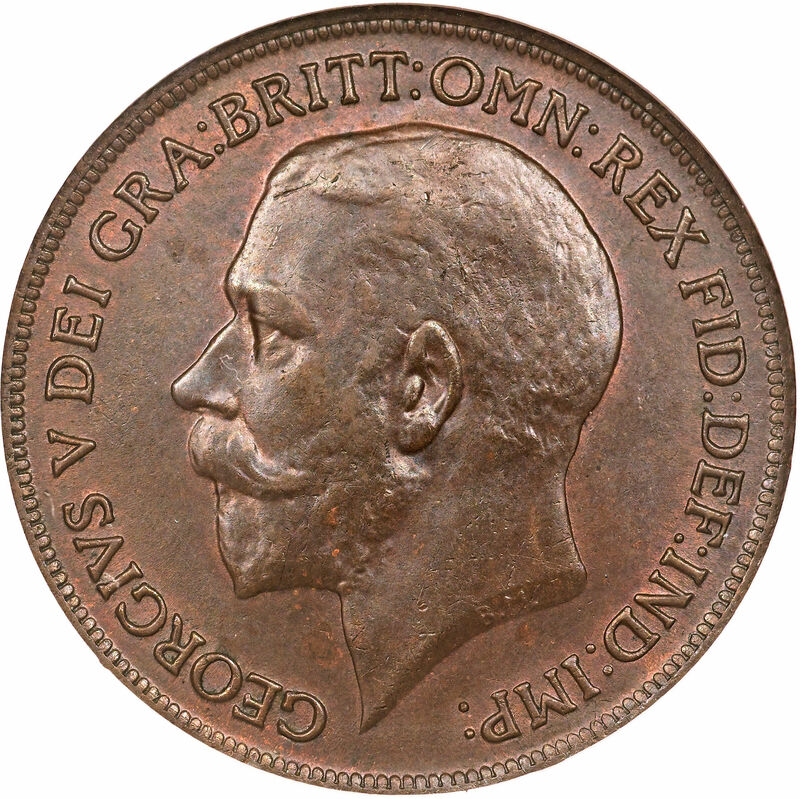 Leonard Charles Wyon was a British engraver of the Victorian era most notable for his work on the gold and silver coinage struck for the Golden Jubilee of Queen Victoria in 1887 and the bronze coinage of 1860 with the second head portrait, in use from 1860 to 1894. 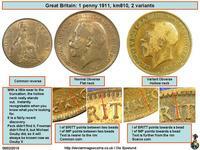 The standard weight of these pieces was 48 to the pound avoirdupois (1/3 ounce or 145.8 grains). 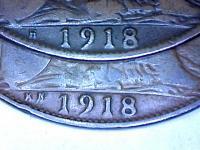 1911 varieties: Two obverse varieties exist for the 1911 dated issues. 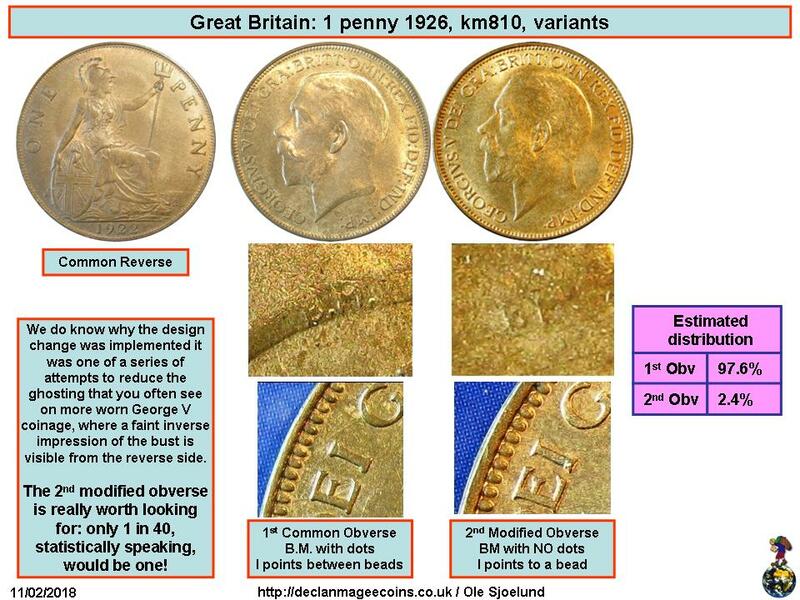 We are indebted to Declan Magee Coins and Numista member Sjoelund for the image below indicating the differences. 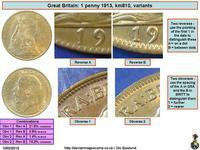 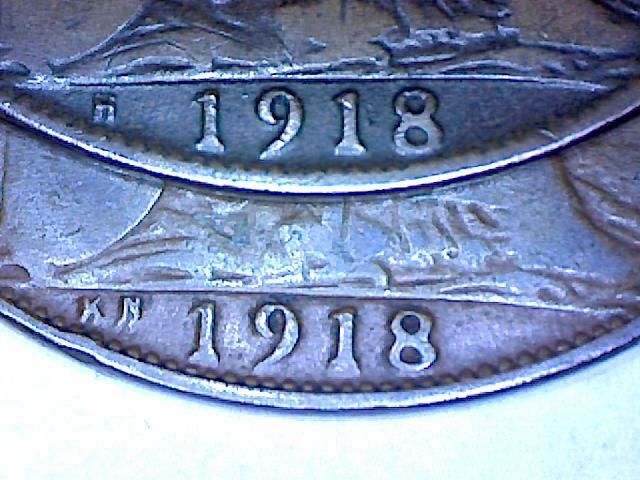 Mintmark varieties 1912, 1918, 1919: There are mintmarks on some coins (1912H 1918H 1918KN 1919H 1919KN) to left of date. 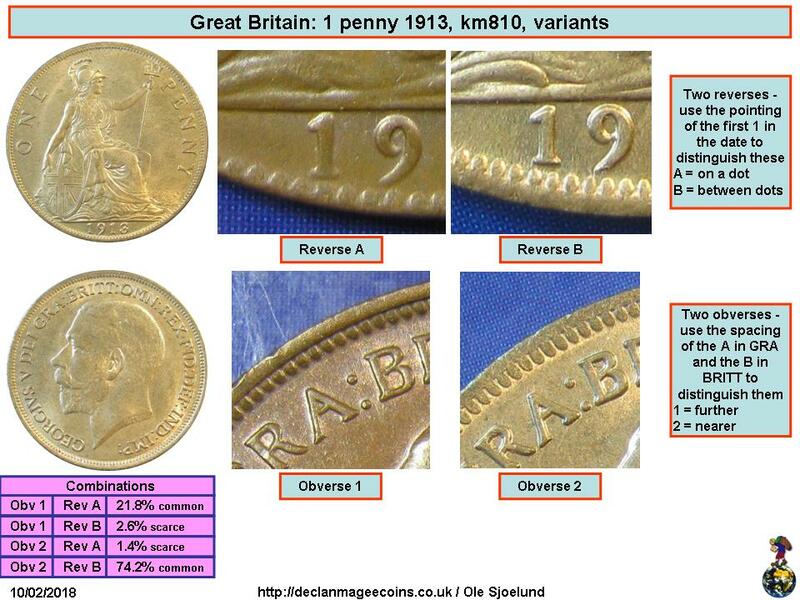 1913 varieties: Obverse and reverse varieties exist for the 1913 dated issues. 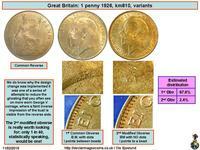 We are indebted to Declan Magee Coins and Numista member Sjoelund for the image below indicating the differences. 1922 variety: In 1922 a rare variety is 'Reverse of 1927' which has three noticeable features where (1927 type on right of image) the teeth on reverse are longer, the thumb on the shield is shorter, and the shield is further away from the edge so creating a longer horizon. 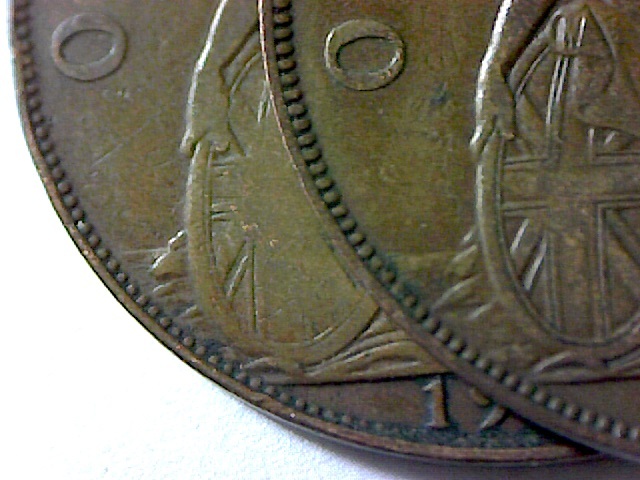 1926 varieties Two obverse varieties exist for the 1926 dated issues. 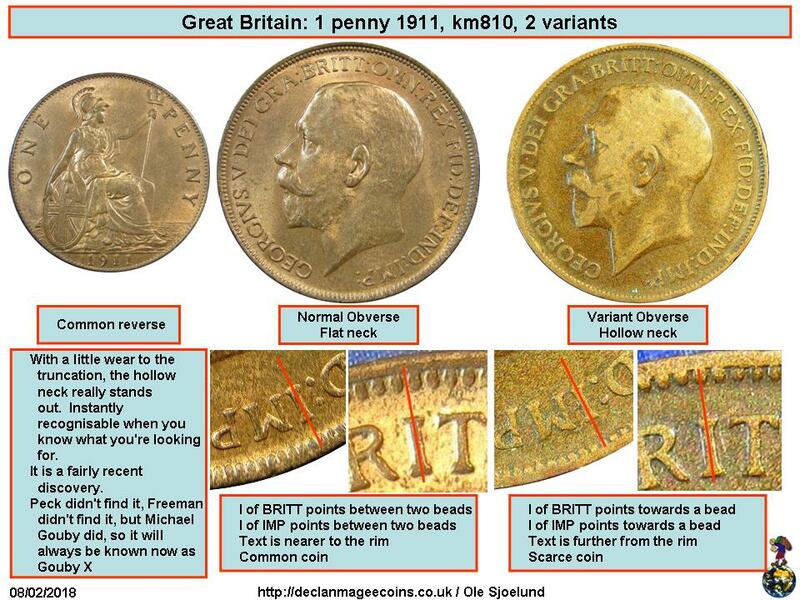 We are indebted to Declan Magee Coins and Numista member Sjoelund for the image below indicating the differences.